In April 2014, Rachel Panitch spent four weeks as Artist-in-Residence at Zion National Park in Utah, where she created several works inspired by the park—including an online “Musical Map”—and performed her music on site. 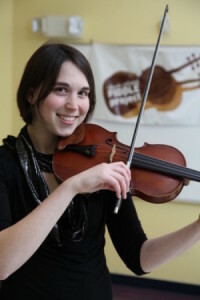 A fiddler, composer, improviser, and educator based in Boston, Rachel’s varied musical output combines influences from varied aural and folk traditions from North Indian Raga to contra dance. Rachel and I first became acquainted through the Entrepreneurial Musicianship grant program at the New England Conservatory of Music, where we both studied. I was delighted to speak with Rachel over the phone recently about her time in Zion National Park and the work that she produced there. Below, I’ve highlighted some of Rachel’s thoughts from our conversation, in which she discusses her expectations, surprises, process, interactions, and the approaches she took to engaging with Zion’s landscape through music. I found [the residency] really an amazing experience both musically and just personally. Rachel Panitch: Even once I was told that I’d been successful in getting the residency and had to make the decision about whether I was going to do it or not, I was hesitating a little because I couldn’t figure if it was just this romantic idea that I had. I wanted to be in a completely different kind of place that was inspiring and kind of away from things, experiencing a National Park and writing music about it. Once I got there, I was so happy that I had done it and I found it really an amazing experience both musically and just personally, to be in this space for a month that has inspired so many people to both preserve it and make art about it. I had been really interested in Pauline Oliveros and her work and the sounds of the canyons and the stars that show up in her stuff, and [John] Cage’s stuff…Instead of specific pieces, it was more just Pauline Oliveros’ concept of deep listening that I was trying out as I was walking and listening. I have never hiked so much alone! And usually I wouldn’t even feel comfortable doing that, but I had this park radio that I’d been trained to use, so all of the sudden I’m on all these solo hikes, which was something totally new to me. Not that any of them were crazy challenging or anything. But just the experience of walking alone for five hours, that was profound. And so I got a chance to practice listening to what otherwise just starts to blend in. One time that I found that I was hearing more was when PBS came to do that video [for Utah Bucket List; see video at bottom of post]. It wasn’t until I was spending time with that PBS crew for three days and their audio guy that I realized how many jets were flying over the park! For some reason, even those had just blended in for me into the surroundings. Whenever we were trying to get clean audio, when we were hiking, we’d just have to wait or pause no matter where we were in the park. So, that was a neat way to start listening slightly differently. It’s like any other art form, in that you can create a great piece of art but when someone sees it they don’t say, “Okay, I’ve already seen it.” They want to see the original, they want to see the actual park. And that can inspire people to go visit and be there. I was thinking that my music could potentially act in the same way as any other piece of art. Plus, it’s really transportable. I mean, you can take it anywhere, and it doesn’t have to be played by me! It can be played by other people. Fiddle tunes are really easily passed on from person to person and shared from people’s repertoires, and when people learn a new fiddle tune, they really like to know the name of it, and the origin story. I guess that’s where the fiddling can connect back in for me. Fiddle tunes are really easily passed on from person to person and shared from people’s repertoires, and when people learn a new fiddle tune, they really like to know the name of it, and the origin story. If a fiddle tune is called Menu Falls Jig, they want to know, where is Menu Falls? There’s a lot of fiddle tune books that have been published where, each tune in the book has a paragraph on it in the back of the book. It makes it more interesting and it gives it more life to have a story behind it. I started every morning with ten minutes of improvising…in the cabin, in the mornings while the turkeys and the deer wandered around…It was this really nice quiet time before the park would fill up with visitors. The cabin where I was staying was just beyond the line of where the lodge is, so I was as far in as anyone was staying. So, it was really, really quiet at night, but then the shuttle buses start rolling in at 8 o’clock. Now looking back, [ten minutes] sounds really short, but it was good. It’s not something I do every day in general. But there, I did, and I recorded my improvising. From there, I was able to pull little snippets or things I really wanted to work with. I had in mind the different kinds of pieces that I wanted to write, or at least attempt. Like, I wanted to attempt a string quartet, and I wanted to write something for my improvising trio with vibraphone, violin and voice, and I wanted to write a reel, and a jig, and other things, so I had one desk with each spot on the desk was representing a different piece. That way, if there was a little motive I wanted to use, or little ideas, I could see where they fit best, and even move them around. It was neat when I was on a particular trail walking and saw this really weirdly angled log that was balanced between these two rocks. I thought that was great, and then I took a picture of it and was able to reuse that in the concept piece for the improvising trio. But I didn’t have a sense of which piece it was for when I saw it. So, I was just trying to collect a lot of different ideas from my playing and my experiences while I was there and then I’d kind of sift them into different boxes later. I was really happy to have so many interactions with visitors, park rangers, and park rangers who were also musicians, and the PBS crew. That was a huge highlight, just getting to hang out with them for three days and see things through their eyes. I definitely wanted to have a bunch of solitary time the first couple of weeks, but then it became really nice to start sharing some things with other people and bouncing ideas. One of the pieces I did, which was my violin solo, came right out of a comment from someone visiting the park, who I was sitting with on the shuttle bus, made about the park being perfect for Bulgarian women’s choral music. So, that piece wouldn’t have happened if she hadn’t said that to me. That was a really nice thing, to interact with visitors. Things that inspired me were: light, color, angles, textures, places, experiences, words, images, feelings. Going into it, I was expecting that some natural sounds would inspire some of what I wrote, and they did a little bit, but the list I have here of things that inspired me were: light, color, angles, textures, places, experiences, words, images, feelings. And, again, it kind of connected me back to any other art form. It doesn’t have to be music. One of the pieces I did and performed at my park presentation, and I’ve tried playing it a couple of times since then, is something I call Imposed Synesthesia. So, I took all these photos that I’d taken of really different colors I’d seen in the park—they’re not great photography or anything. I tried to get ten different photos of ten very different colors that I saw and they would be projected onto the screen, and I’d play an improvisation based on it that’s about six minutes long, following the changes in the colors. Image from “Imposed Synesthesia.” Photo by Rachel Panitch. I was curious how the different colors would influence my playing. But, I found that what influenced it even more was looking at the textures. Like, one of the brown things turned out to be cryptobiotic soil and it’s this really interesting texture of brown. 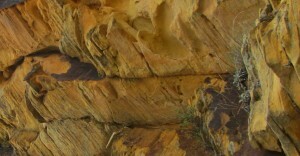 And then, there was a rock face that was like grilled cheese. Textures, I think I can find a way to—people can get it, how it’s related to the sound. You can use articulation, and you can use specific rhythms, and it feels like there’s a specific connection there. And then the other thing is literal ups and downs. … Maybe it’s because I’m a new composer, but I don’t know, writing a piece about a waterfall, writing a piece about a sunrise, writing a piece that is kind of inspired by seeing cliff drops for the first time, the going up and going down show themselves in the pitches of the music; for me, anyway. Like in the string quartet piece, you can kind of hear literal drops and you can hear a general feeling of awe and you can hear sudden shifts in tempo that come from things just being juxtaposed to each other. I read about some of the painters who first painted Zion over the years [in A Century of Sanctuary: The Art of Zion National Park ]. One of the things [the author] talked about was, painters who lived in Utah painted Zion a lot differently than painters who had come from the East Coast or somewhere else to see it. There was a lot more drama, a lot more, you know, shocking angles and really interesting contrasts in the paintings by the people who had just come here from somewhere else. And the people from Utah tended to paint a way in, or looking from the trail, it was more like a familiar place and it came through in the visual experience. The music that I wrote changed from day 1 to day 30. I think the music that I wrote changed from day 1 to day 30, and the kind of pieces that I was writing. In the string quartet the little motive I was using was really a dramatic, awe-inspiring, see-it-for-the-first-time thing…by the end I was writing some different kind of things about the experience; about the experience of just kind of walking on your own on the trail and the comfort of doing that. When I did my end-of-residency presentation at the Springdale, Utah library in town—there were a lot of rangers there and lot of local people there—I made a bunch of notes of people’s comments that night. I was really so happy with the way that people felt like they connected with the different pieces…A bunch of the tunes that I wrote, everyone had a different one where they said, “that one felt right,” or “that really captured ___”. People had different reactions to different tunes, but everybody had like one that they felt like really captured it for some reason. It was so nice and strange coming from outside. It made me really happy that they felt like that I had done their world justice in a different, musical form. That was definitely a moment where I felt good about my own music. So far, when I’ve performed pieces [in Boston], the comments I get from people coming up afterwards were, “that really brought me back,” or “it reminded me of when I was in that part of the world,” it’s mostly people who have been there who have talked to me about it. But, it would be really interesting to see what sense people get or what images come up when they hear pieces about a place they’ve never been to. But I’ve never gotten that comment, so I don’t know! You can hear more of Rachel’s Zion-inspired pieces, as well as her field recordings and journal notes, on her Musical Map. Keep up to date with Rachel’s activities at her website, or learn more about Zion National Park’s Artist-in-Residence program. This entry was posted in interviews and tagged creative process, National Parks, residencies by Nell Shaw Cohen. Bookmark the permalink.